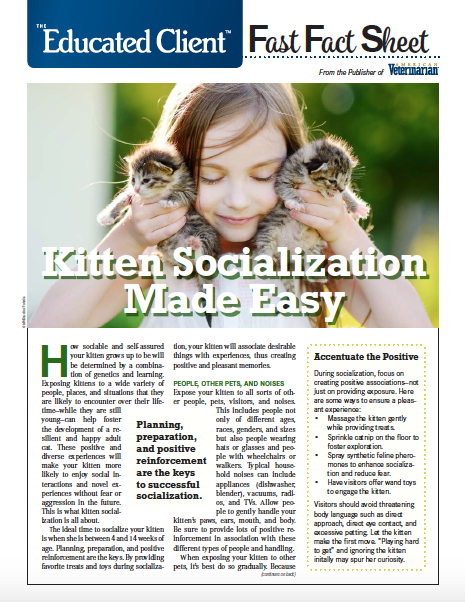 Planning, preparation, and positive reinforcement are the keys to successful kitten socialization. How sociable and self-assured your kitten grows up to be will be determined by a combination of genetics and learning. Exposing kittens to a wide variety of people, places, and situations that they are likely to encounter over their life- time—while they are still young—can help foster the development of a resilient and happy adult cat. These positive and diverse experiences will make your kitten more likely to enjoy social interactions and novel experiences without fear or aggression in the future. This is what kitten socialization is all about. The ideal time to socialize your kitten is when she is between 4 and 14 weeks of age. Planning, preparation, and positive reinforcement are the keys. By providing favorite treats and toys during socialization, your kitten will associate desirable things with experiences, thus creating positive and pleasant memories. Expose your kitten to all sorts of other people, pets, visitors, and noises. This includes people not only of different ages, races, genders, and sizes but also people wearing hats or glasses and people with wheelchairs or walkers. Typical household noises can include appliances (dishwasher, blender), vacuums, radios, and TVs. Allow people to gently handle your kitten’s paws, ears, mouth, and body. Be sure to provide lots of positive reinforcement in association with these different types of people and handling. When exposing your kitten to other pets, it’s best do so gradually. Because a cat’s sense of smell is very import-ant, you might try transferring some of the smells of other pets onto your kitten before making introductions. It can also help to introduce the animals to each other when they are separated by a baby gate or cracked door. This allows them to meet each other by scent first. Introduce kittens to calm, gentle dogs at first, preferably while the dog is leashed. Incorporate positive reinforcement training and/or special meals with these controlled introductions to create positive memories. Of course, be sure to separate the animals if either of them shows signs of fear or aggression. To associate a pleasant response to the presence of the carrier, leave the carrier open in the kitten’s environment. Kittens should have the option to enter and exit the carrier by choice. Provide comfortable bedding in the carrier while occasionally hiding treats and toys for exploration. Feeding canned food in the carrier daily allows for a positive experience. Once the kitten is comfortable with the carrier itself, place it inside a vehicle. (Be sure the vehicle temperature is appropriate and comfortable first.) Secure the carrier on the floor behind the passenger seat, and make sure the kitten has good footing for stability. Take a few short drives around the neighborhood, followed by a special meal fed while the kitten is still in the carrier. To create a positive association with the veterinary hospital, try taking her there on a day when she does not have an appointment. This exposes the kitten to the building and equipment and allows her to meet the staff without having any procedures performed. When socializing your kitten, it’s important to be able to detect when the animal is feeling anxious, stressed, or frightened and needs a break. Cats will show both overt and covert signs of distress.